Was Tre Smith’s touchdown flip against Florida deliberate? Tre Smith flips off Florida in 2006. 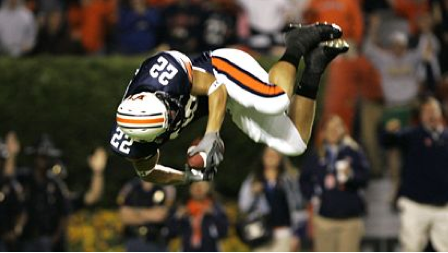 Auburn (somehow) may not have won anything at this year’s ESPY Awards, but remember that time Tre Smith’s blocked punt return for a touchdown against Florida in 2006 won us, like, a million dollars or something as the Pontiac Game Changing Performance of the Year? And remember that time some folks dared chastise the young white god of the 2002 Iron Bowl (who did not miss his chance to blow) for that fabulous, fabulous flip that got him across the goal line? And remember that time—talking to myself here—I walked over with a plate of Sargento cheese cubes (and vomit on my sweater already—mom’s spaghetti) and asked him about it up in Birmingham at the AAFL Draft Event in January 2008? Tre: Honestly, I wasn’t even trying to flip. Tre: The thing was, when I saw the ball rollin’ and picked it up, I thought somebody was trying to tackle me from behind, but it was my own player falling into my legs. I jumped to avoid getting tackled, I wasn’t trying to do a flip. TWER: Yeah, I never thought it looked planned. To me it always just looked like your momentum forced it—made you tuck and roll. Tre: Yeah, I mean, it was too spur of the moment to plan it, I didn’t even know it ended up looking like that. Exactly—one again, he lost himself in the moment, he owned it, and he’s going to never, ever let it go. * Auburn is the question, Cam the answer on Jeopardy! One of my most vivid memories, and I wasn’t even in the stadium. We watched it at my mother in law’s motor home out near the greenhouses on Donahue, almost to S. College. Kickoff was just at sunset and there was a flyover. We could see the jets hovering in the twilight against the setting sun. It was a strange kind of quiet – it felt like a movie. They moved almost silently in from the Wire Road area. Then they dropped the hammer and completed the flyover. They disappeared almost instantly. One of the most amazing things I’ve ever seen. We were watching on satellite, so there’s several seconds delay between what happens and what we saw. Just as the UF punter stepped back to receive the snap, I heard the loudest explosion of sound I think I’ve ever heard. I started screaming – “It’s blocked, it’s blocked, it’s blocked! !” before I ever saw the snap. The in-laws thought I was crazy. I was right though. It was fantastic. Hundreds of people in our area were losing their mind. It was fantastic. That’s probably my favorite not-in-stadium football memory. @ 2xTiger … Awesome story. I was in the stadium. Sounds like you had a better view of the flyover though. I wonder if a touchdown like this would be called back under the new “celebration rule.” You can’t explain to the ref that you thought someone was about to tackle you. The new rule could be devastating for some team(s) this year. @ Neal – you sir are correct. I thought my ears were bleeding and loved every minute of it. Reminded me of these posts over at theauburner. hilarious! there was also a psychedelic jpg pic floating around that showed smith flipping. I tried to find it, but couldn’t.